I have been asked how it is possible to change my color scheme every year… it’s all about color coding and organization, baby! I don’t really even bother with all of the little cardboard dividers anymore if I am just storing the regular ball ornaments. There are thousands of them, so if there are a few casualties each year, so be it. By the way, that baggie on the left that says “Decoration Only – Do Not Eat”…? It’s full of peppermint sticks and candy canes. I store them for years. No one at my house likes to eat them, but I love to put them in jars and use them as part of my Christmas decor for years when I use red. I also keep the ornaments for the kids’ tree separate as well. 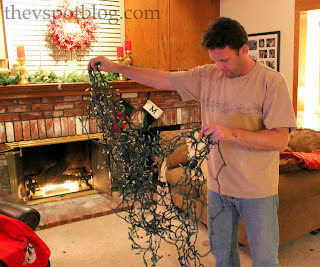 …by simply putting each strand of lights in a plastic grocery bag, then putting them all in a bin. Clearly labeling boxes helps Handsome Hubby each year as he is putting things away. Anything that is marked with Every Year is stored where he can easily grab it for next season. Every Year includes the boxes with the Christmas toys, music and DVDs, as well as my fake garlands and wreaths. Also? 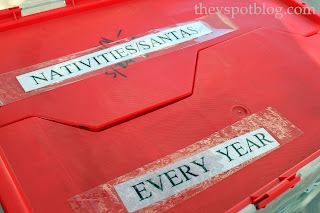 The color coding also helps HH know which boxes he doesn’t need to pull out each year. I have already decided on my color scheme for next year, so as he’s putting the red and gold boxes away, he will be sure to move the white, silver, blue and green ornaments towards the front. So between the boxes sorted by color and the clear labeling, corralling all of my Christmas decor is much, much easier. Now where is my Valentine’s Day stuff…. Up to my eyeballs in ornaments now! Great ideas! I love your helpful ideas…after all these years of storing decorations….I think you have helped me a ton…..barely getting to it today!!!!! THANK YOU!!!! Do not eat…I love it! This is one area where I’m fairly organized. 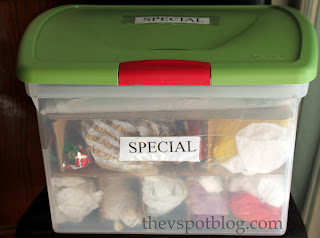 I do want to get one more container for the stuff that I don’t put out every year and maybe get separate containers for each kids’ ornaments so they each have a container to open with only his/her stuff. 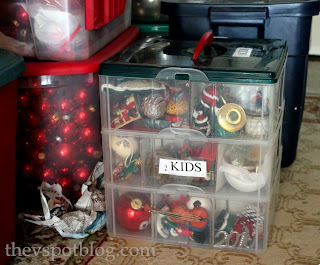 I love it – the queen of Christmas organization!!! Organization makes me happy. i love how organized you are. I will be trying for colors in the very near future. I don’t have enough of any one or two colors right now (since I just started putting up decorations and a tree last year). I’ll get there eventually! Ha! 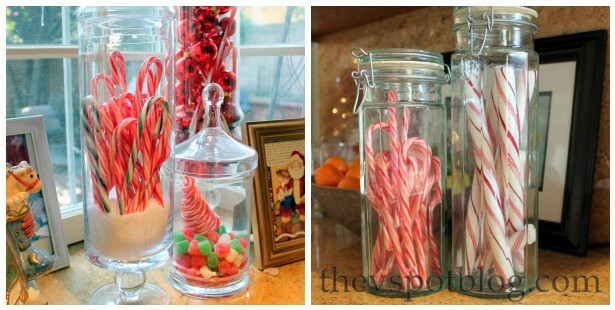 This reminded me of the time I also decided to store candy canes with the rest of the decorations. The following year, I went to get the boxes out of the nice, carpeted walk-in closet underneath the staircase off the living room, and all that was left of the candy canes were the hollow wrappers! Huh??? How could that be? I scratched my head for a few days over that one. Then it occurred to me – the ants must have eaten them because there was a tiny pinhole in each wrapper, which was nearly invisible. I don’t know if you ever have ants at your house, Vivienne, but we live in SoCal also, and they can be a problem! In the ten years we lived in that house, I never saw any ants in that closet, though. I am a complete organization geek and love what you’ve done! Great tips Vivienne! I just got back from our trip and have to start taking down the rest of my Christmas decor this week…ugh. But seeing this post motivated me to try some new things this year and hopefully have it all more organized for next year. Thanks so much for the hints! Love this, Viv. A good example of the KISS principle, huh? Last year was the first time I put all the Christmas balls in one big bin and I only had one casualty in that bin. Organization is key to stress free decorating. That is what I am looking for!! Valentines!! Ha! ok, you make me feel bad….hahaha, I just throw mine in a box, shame on me!!! You should be on that show on TLC or whatever…where they have a paid organizer come in?? Yeah. I like the idea of storing stuff by color! I, too, use grocery bags for the lights. I’ve thought that I should save styrofoam egg cartons to store some of the smaller, more delicate ornaments, because wrapping them all in tissue gets old. I am a new follower andhave loved so many of your ideas and pintrested tons of them. But now I have a tip for you. You know the light storage you do? I must say I like mine better. We took a large board and cut out the letter “H” then we simply wind the lights up hooking each strand together as we go. Never a tangle or broken light. Great job on staying organized! This is something I wanted to do more of this year… including making a spreadsheet and inventorying all my halloween goods (including numbering the bins)!